A novel crowd-farming venture is offering a way to make money till the cows come home. You might imagine R1-million to look different. For one, you might not expect to find it in the Midlands of KwaZulu-Natal, bellowing, eating grass and swatting bothersome flies with its tail. It has been going for only a few months but Ntuthuko Shezi’s fledgling investment company is already managing assets worth R1-million. Unusually, the assets in question are cows — and they offer an annual return higher than even the JSE. 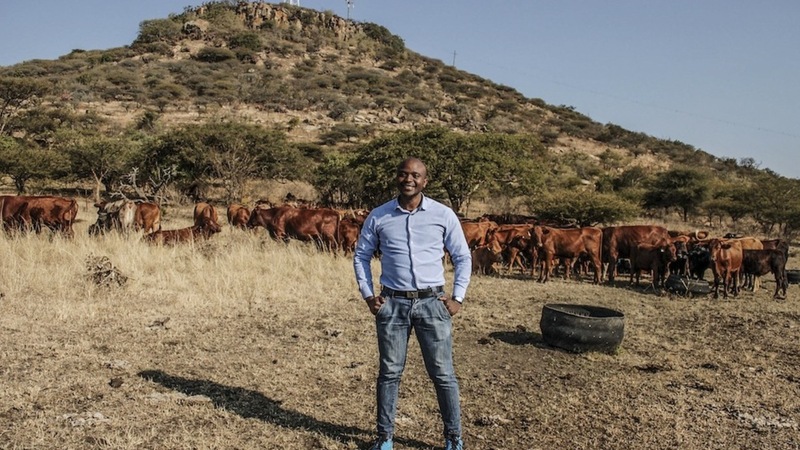 In October, serial entrepreneur Shezi launched his venture, Livestock Wealth, an online “crowd-farming” platform that allows clients to invest in cows. A potential investor anywhere can go to the site and, from photographs, select a pregnant heifer, currently priced at R11 675. Once it has been added to the online shopping cart and the terms of the investment have been agreed to, the investor needs only to punch in their card details, or transfer the amount via PayPal, to become a proud owner of a cow. For a monthly fee of R225, the cow will be cared for and vet bills taken care of. The aim is that each year she will give birth to a calf, which she will suckle for about seven months. At that stage, the calf, known as a weaner, will be sold to a feedlot at a market-related price per kilogram. The total sum fetched is then divided among the investors. Livestock Wealth does not take a cut of that. According to market indicators from the South African Feedlot Association, in March this year a live cow with an average weight of 466kg was valued at R10 630. In the same month, weaner prices averaged R20.85 a kilogram. The value of an average calf weighing 231kg was R4 816. The data shows that the price of weaners has stayed at roughly between R15 to R23 a kilogram since 2011. At current prices, Livestock Wealth claims an investor’s average annual return, which takes the monthly fee into account, is about 16%. Last year, the JSE top 40 annual return was half that, at 8%. Livestock Wealth makes its money on a mark-up on the price of the pregnant heifer and from the monthly fees and insurance offerings. “The first two things people want to know is: What happens if my cow dies, and is Livestock Wealth legitimate?” Shezi says as we drive along the long and well-used road to the farm in Blood River near Vryheid. The answer to the first question is that there is already a basic insurance on the cow in the event of death caused by illness. There will soon be optional extra insurance at a monthly cost of R38 per cow to cover death caused by other things, such as lightning, snakebite or even falling off a cliff. When the cow becomes too old to breed, it is replaced at no cost. To answer the second question, Shezi says investors receive a tax invoice for each cow and relevant papers. An ownership certificate is issued by the company. “If something happens to me or my business, the investor can come and take his cow,” he says. Furthermore, Livestock Wealth is being audited by a prominent firm, SizweNtsalubaGobodo. It is early days yet and Livestock Wealth has about 50 investors who own 87 cows. Shezi had hoped to be managing 1 000 by June. Of his investors so far, 65% are black and the balance are white, mainly Afrikaans speakers. Shezi grew up in Ndwedwe on the KwaZulu-Natal north coast. His parents never owned cattle but his grandparents did. But the herd didn’t appreciate much in value and, in the end, there was nothing to pass on to the next generation after the last of the group, named Seven, was killed when she fell off a cliff. Although just a toddler at the time, Shezi recalls the merriment as members of the community rushed to the carcass with buckets to carry the meat away. “That was before refrigeration,” he says. Like his grandparents, many South Africans own cattle but are not seeing significant returns, Shezi says. According to the department of agriculture, in 2014, 60% of the 13.84-million cattle in South Africa were owned by commercial farmers and 40% by emerging and communal farmers. Shezi says these owners could realise better returns by selling their cows and using that money to invest in Livestock Wealth. In cases where cattle are being held for traditional purposes, such as lobolo, the investor is assured that the investment grazing in the veld in either Vryheid or Kokstad can be liquidated immediately. Those investors who do not wish to invest online can deal with the company directly. Shezi intends to arrange regular trips for investors to visit the cows. One such trip took place in January, and another is being planned. Livestock Wealth leases the land on which it runs the cows, which is no big deal as far as Shezi is concerned — property rights have never been an asset in tribal areas, where the land is leased from the chief. Individual wealth has always been vested in the cattle. Livestock Wealth leases 200 hectares of a 680-hectare farm outside Vryheid and has an arrangement to lease grazing land on a 1 800-hectare farm near Kokstad, paying the landlord a rental fee per cow. “The price of cattle has gone up, big time. With the drought, cattle are scarce,” says Bill van Lelyveld, the silver-bearded owner of Clanwill Farming in Blood River. The rising value bodes well for Livestock Wealth investors as the calves should fetch a good price, although buying new heifers will be more expensive. Although water levels are lower than normal at the moment, the area receives 40% more rainfall on average than other areas and has been less seriously affected by the drought. Van Lelyveld is excited about the project mainly because it is a way that land can be kept productive, even if it is leased and not owned. It’s a good model to be replicated in cases of land reform, particularly where there are no title deeds, he says. If managed correctly, “this is a wonderful way to preserve the land and make money”. There are other similar, although less formal, investment schemes. Over a cup of coffee and brown-bread sandwiches in the farm office, Van Lelyveld tells Shezi about an operation in the Eastern Cape where buyers can invest in a share of the farm’s business. “You can’t invest in one sheep. The one looks like the next,” Van Lelyveld remarks. But there is a deeper connection to cattle, which can be individually identified. A short drive in Van Lelyveld’s dusty Land Rover takes us to the Livestock Wealth herd of 70 cows and 25 calves on this farm. (The other 17 cows are on the Kokstad farm.) They are a motley crew. Shezi says Livestock Wealth is fairly “breed agnostic”, with a mix of Bonsmara, Beefmaster, Simmental and other cattle types in the herd. “When you sell a cow to a feedlot, it doesn’t matter how beautiful it is, it’s the weight that matters,” Shezi says. For this reason, Nguni cows are not ideal because they are smaller than other breeds. Seemingly not as agnostic is Van Lelyveld, who has Brahman stud on the farm and is also chairperson of the KwaZulu-Natal Brahman Association. His Brahman bulls are mated with the Livestock Wealth heifers to create hardier offspring, and he enthuses about what a robust breed they are. Van Lelyveld has been on the farm since 1986, but it is on the market and he hopes to retire soon. Shezi says the government is a potential buyer and Livestock Wealth is developing a relationship with the department of land reform so that it could have the first option to use the land if it becomes available. Thirty-five-year-old Ntuthuko Shezi funded the first 40 head of cattle for his investment company, Livestock Wealth, with a loan taken out against his first business, which he continues to run. Scratch Mobile is a vehicle repair centre run from OR Tambo airport that will fix your car while you are away. The service can also be provided at a client’s home or office. By entering a number of pitch competitions, Shezi has since been able to secure R500 000 from the Bank of America Merrill Lynch for the Livestock Wealth project. A further R400 000 was awarded to him through the Gauteng provincial government’s Innovation Hub. Ever the dealmaker, Shezi and his family have lived for 10 years in a mansion in Houghton. When he realised the property had been abandoned, he tracked down the owner (a German national who had returned home) and arranged to manage the property in exchange for living there. Shezi has a number of ideas in the pipeline for Livestock Wealth, ranging from an app that will go live next month and let investors monitor developments at all times, to technology that will enable him to establish each cow’s vital signs and whereabouts remotely. He even hopes to introduce a product where a cow can be bought on credit and paid off over time. Lisa Steyn is a business reporter for the Mail & Guardian.